During spring break, my older sister went on her usual “make-the-entire-family-jealous” type of spring break trip. Last year it was a cruise to Mexico, this year it was Barcelona. When she returned home to the States, she gifted me with one of the best souvenirs I could ask for: a miniature cactus inside a tiny mug magnet with the word “Barcelona” scrawled across the handle. I love succulents and I love mugs, so this was the best souvenir I could ask for. I stuck it on my fridge and left it there, aside from its weekly waterings. That was when “the Incident” happened. I was stressed out, as I had one project, three statistics assignments, one take-home-quiz and one finance homework set due all at midnight that night. My 11 month old German Shepherd puppy was sitting patiently with his rope toy waiting for me to throw it. Distracted by homework but wanting to be a good dog mom, I threw the toy without even watching where I was throwing it -- a bad idea in any circumstance while living in a suite style dorm. The toy crashed into the fridge, ripping the magnet with my cactus in it off and throwing it to the ground. I went to pick it up (mainly so my puppy didn’t eat it) and realized that not only was the magnet was pulled off the side of the mug, but the handle, the one thing that actually said “Barcelona” on it, was in two separate pieces on the ground. After recovering the pieces, I tried to think of what I should use to put it back together. That’s when I remembered that I had Krazy Glue All Purpose Singles. This was the perfect solution for fitting the pieces back together. Not only are these super convenient to keep in the dorm room or take on the go, they are meant for single use so you don’t have to worry about re-packaging them or leaks. I put the glue on each of the pieces and stuck them back together and I could not be happier. The glue dries quick and easy, and you can barely even tell that it’s there when you’re done. My magnet is now once more in its rightful place on my fridge, and the only reason you can tell it had been broken is because I let a piece glue on crooked. The only complaints I have are minor and easily avoidable. 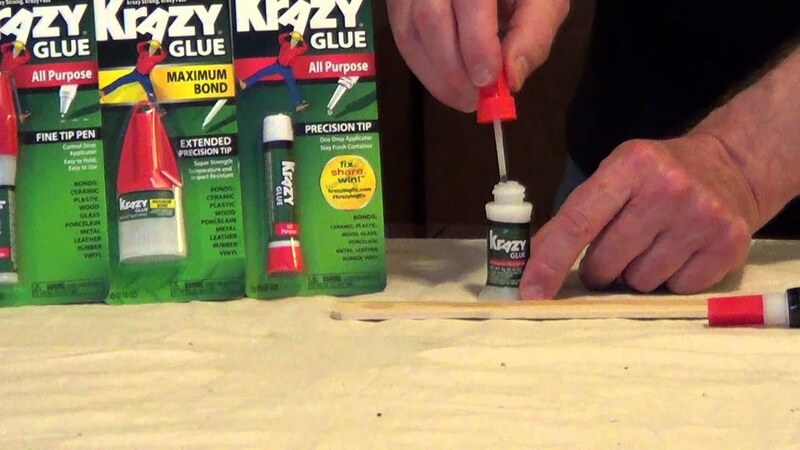 This glue dries “krazy” fast, so make sure you’re putting the pieces back together perfectly or moving them around quickly so they’re exactly where you want them to be when the glue dries. Also, avoid getting it on your skin! The glue is clear so you might not notice it touch your skin, and when it dries, it makes your skin feel tight and rough. It was relatively easy to wash off (with a good amount of scrubbing). All in all, this glue is incredible! It is a life saver in the dorm and glue this size can easily be carried on the go or kept in the dorm so you can have it handy whenever you might need it. Life seems determined to stress you out in college, but this all-purpose glue will have your back!